A. There is a great demand for food in winter as natural supplies decline. Do not prune plants with berries and seedpods, like viburnums, staghorn sumac (Rhus typhina), roses with hips, coneflower (Echinacea), goldenrod (Solidago), or ornamental grasses. These provide natural food sources and help birds in the beginning of winter. After the first hard frost, natural foods may not be available or may be buried under snow and ice. Bird feeders are a popular and effective way to attract and feed birds throughout the winter. Dawn and dusk are the two most active periods for bird foraging. There are many different food combinations that attract different types of birds. Beef suet provides a rich supply of fat and is eaten by at least 80 North American bird species. Adding cornmeal, peanut butter, or bacon grease expands the appeal to a greater variety of birds. Mix until it is the consistency of bread dough. Suet can be pressed into pinecones or cupcake baking tins. If overcrowding becomes a problem, avoid mixing seed with suet as that will attract both seed and suet feeders. Instead, offer seeds separately in another location and make sure feeders are at least several feet apart. 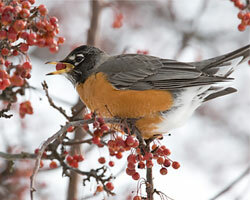 Fruit, such as grapes, raisins, and cherries, will attract fruit feeders, such as robins and woodpeckers, that will not be attracted to the suet or seeds. Evergreens protect birds from the cold, wind, and predators, too. Please contact Plant Information Service at (847) 835-0972 or plantinfo@chicabotanic.org for more information.